I am always looking for gift ideas to help make the holidays a little easier. Sometimes looking for different gifts for every occasion can get tiresome. With Corso’s Cookies you are set for gifts for the whole year! They even cover holidays that you might not even think about sending a gift for. This makes it easy to hop on their site and send a gift to just let people know you are thinking of them. *I received the product shown below in exchange for my honest opinion. 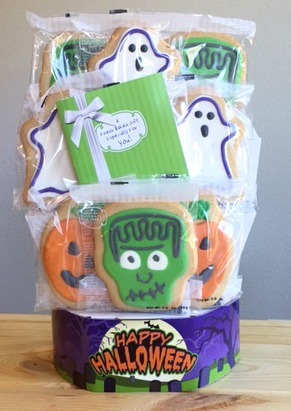 The cookie bouquet that I received from Corso’s Cookies was the Haunted Halloween Cookie Bouquet. This bouquet is available in either 6 or 9 cookies. They come in fun Halloween themed characters and makes for a great decoration during this season, until you eat them all of course! It is great that these cookies come wrapped, it allows for you to be able to savor these cookies longer. That way you can enjoy celebrating Halloween all month long! These are the three cookies that come in the bouquet. Since we got the 9 cookie bouquet each character was on three of the cookies. My personal favorite was the jack-o-lantern cookies. They were really cute and added a lot of color to the bouquet. My daughter’s favorite were the ghosts. Along with being really cute these cookie are also delicious. When I first got the bouquet I could tell that they were hard, which I was a little disappointed with (I should have known though that they would have been since they are shortbread cookies). Then I ate my first cookie and I was happily surprised that I ended up loving them even though they were not soft. One thing that I will mention is that because they are hard cookies they can create a mess so I would suggest eating them over a plate or sink. If you are not currently looking for gifts for Halloween that is ok, they have cookie bouquets for the whole year! Some of my favorite, besides the Halloween bouquet is their Birthday Celebration Cookie Bouquet and their Just BEE-Cause Cookie Bouquet. Who do you know who you would love to send a cookie bouquet to? Which bouquet would you send them? Let us know in the comments below! « SwaddleDesigns is the Perfect Place for your Baby Gift Needs!